When you google this guy, what comes up are plenty of links that showcase a career as an emerging Graffiti artist and Painter. 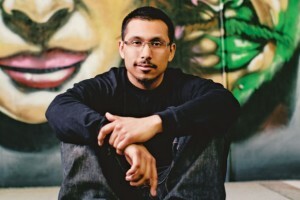 You will find out about a TedX talk and about the half a dozen public murals he’s painted across Omaha. But when you meet Hugo in person, you will also find out that he is really humble about his success. He’s a cool dude who just wants to see his community thrive through the inspiration of art and collaboration. A couple mistakes lead to enlightenment, He remembers. As a preteen, he was sneaking out with his childhood homie in LA to essentially stay out of trouble with the gangs. Ironic right? But seriously – art became a way to express himself growing up. His parents moved here when he was 14 and eventually Hugo was allowed to take his art down a more serious path becoming a mentor through the Kent Bellows program. He also landed a full-ride scholarship to UNO and through the encouragement of his family, continued to grow his skills. He loves to paint. 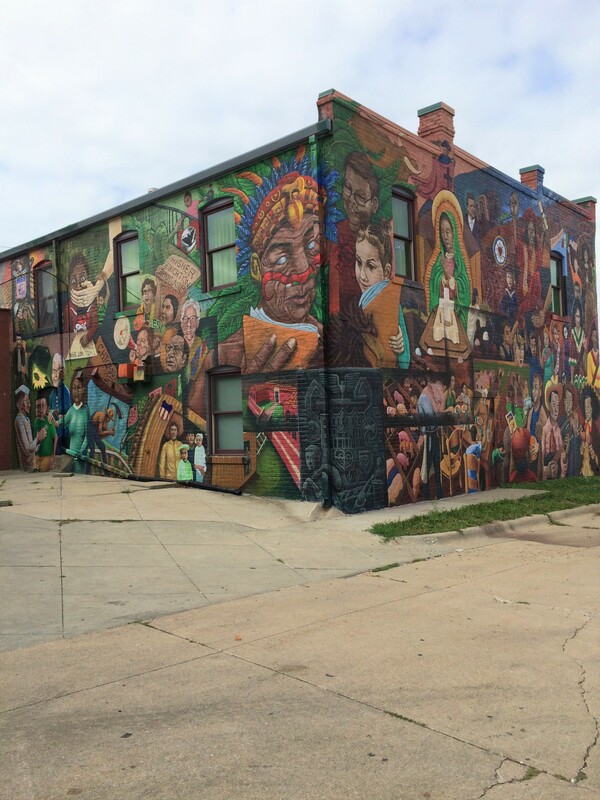 He lights up when he talks about some of the mural projects he’s worked on helping to tell the historic stories about Omaha’s ethnic history along with contributing to the existing culture. 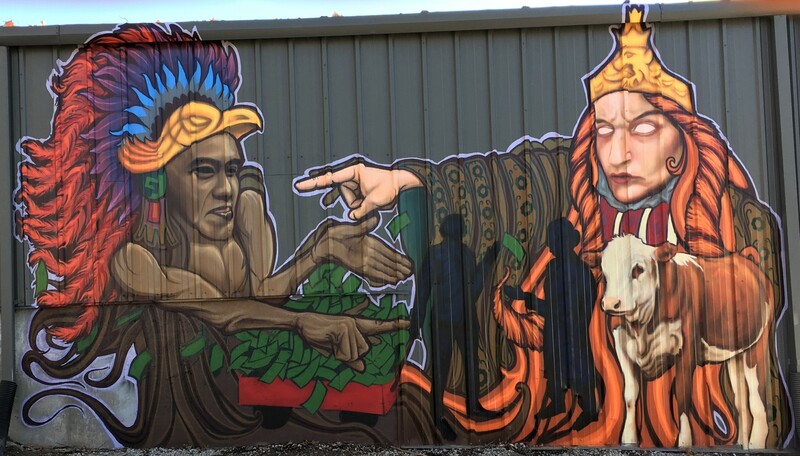 Recently, Hugo finished an aerosol mural on 13th and Williams Street revealing the story of immigration between a Bohemian ruler blaming the Aztecs for ruining cultural heritage. 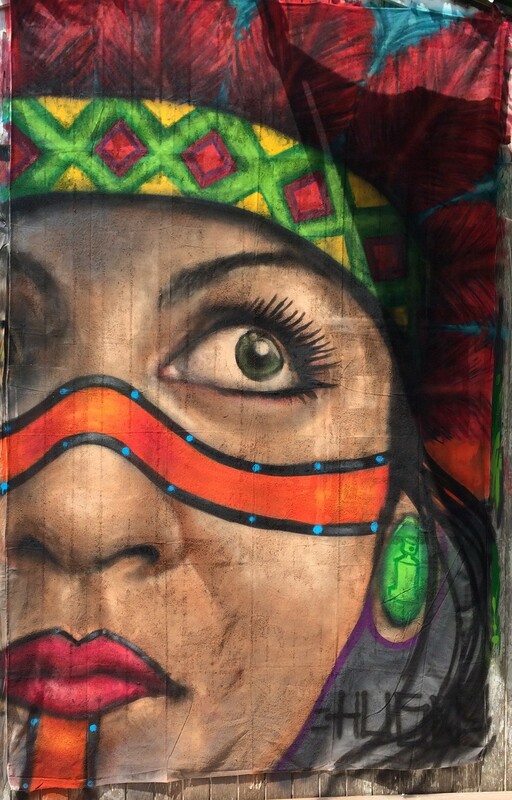 The mural has more complexity when you look closer to see that both parties are to blame for the loss of appreciation and recognition for the other’s heritage despite the fight for territory. Hugo’s natural attraction to Graffiti writing and being an artist is inspired by his love for the culture that birthed Graffiti. Making the connection of Graffiti art to its origins with Hip Hop are put into action as Hugo participates annually with the Abstract Concrete festival that happens at the Bancroft Street Market. It’s a notion of honor to be asked to paint here and even better if you are asked to tag concrete slabs next to some of the city’s best aerosol artists. What are some recent accomplishments for you? “Ah man, I’m engaged to my best friend, I bought a house last year at 25 with the money I made from making art, I live off of my passion which is art. I got best emerging artists award for 2016 (Omaha Entertainment Arts Awards), and the Mexican community mural I painted with my mural team, A Midsummer’s Mural, got best public art for that same year. You seem to really enjoy doing community work as a part of your artist mission too. Do you plan to do more of this? More examples of how Hugo makes a point to give back involve being a teaching artist through WhyArts? where he recently taught students from Norris Middle School how to paint a 40-foot temporary wall. Check the photos to prove it – easier said than done for most! What do you hope to bring attention to for your city, state, nation? – UPCOMING SPRING 2018: Werner Park Mural in celebration of their 50th Season – Learn More. – Lithuanian Bakery Mural (5217 South 33rd Avenue) – Learn More. – UNO Milo Bail Student Center (2017) and Barbara Weitz Community Engagement Center (2014) – Learn More.